Across the nation Democrats reclaimed at least 336 state legislative seats lost during Barack Obama’s presidency. Six state legislative chambers flipped to Democratic control with the 2018 midterm election, and one flipped to GOP control. With the six Democratic pickups (4 senate chambers and 2 house chambers), and the GOP capturing one house chamber, Republicans now control a total of 62 state legislative chambers (32 senate, 30 house), and Democrats control 37 state legislative chambers (18 senate, 19 house). 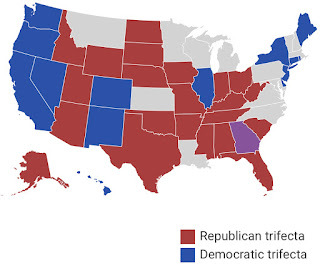 Democrats emerged from the 2018 midterm election with a net gain in state government trifectas, but Republicans still retain a net advantage of at least eight trifectas over Democrats. With the Georgia gubernatorial race called for the Republican Candidate, the new trifecta count stands at 14 Democratic, 23 Republican, 13 divided. The 37 total trifectas ties with 2013 and 2014 as being the most trifectas in recent history. In addition, Democrats gained enough seats to deprive Republicans of supermajorities in Michigan, North Carolina and Pennsylvania. This will keep Republicans from having enough votes to override the vetoes of Democratic governors of those states. Democrats achieved supermajorities for themselves in seven chambers. The 2018 midterm election set a record for the number of single-party-controlled legislatures. When the new legislators take their seats in 2019, Minnesota is the only state in the nation where the legislature is divided — the Senate remains in Republican control, and the House flipped to Democratic control. Minnesota Democrats fell one seat short of flipping the state senate. 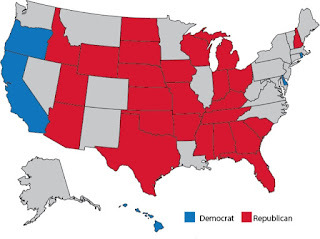 Last time there was only one divided state legislature was over 100 years ago in 1914. A majority of the governors holding veto power over redistricting in 2021 are now Democrats. Moreover, in most states where Democrats won control of a legislative chamber on Tuesday, the legislature has a role in the congressional redistricting process — although Colorado voters took this power away from the legislature via the initiative process. In short, Republican losses in state legislatures were typical for a midterm election, but these losses could translate into larger losses for the party in the future. In New Hampshire, both the House and Senate flipped from Republican to Democratic control. This ended the Republican state government trifecta (where one party controls both chambers of the legislature and the governor’s office). Incumbent GOP. Gov. Chris Sununu (R) was re-elected. In New York, the Senate flipped from Republican to Democratic control. This gave Democrats a trifecta, as they retained control of the House and the Democratic governor, Andrew Cuomo, won reelection. This is one of five trifectas Democrats won in 2018. Colorado Democrats took control of the Senate, flipping the state from divided power to trifecta control for Democrats. Maine Democrats won control of the Senate and the governor’s office, assuming trifecta control. Democrats retained control of the state House. Republicans took control of the Alaska House, retained control of the state Senate, and won the governor’s office that is currently held by an independent. 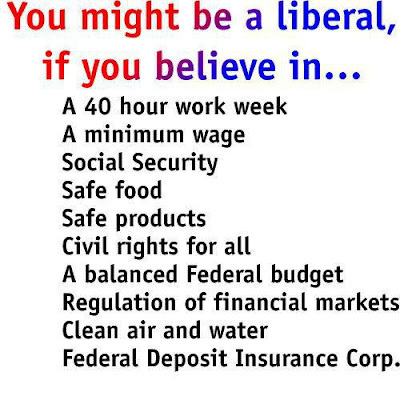 This gives the Alaska GOP trifecta control. Minnesota replaced one Democratic governor with another, and the House changed from Republican to Democratic control. But the Senate remained in GOP hands. Over 8.3 million Texans turned out to cast ballots in the 2018 midterm election, yielding a turnout rate rivaling presidential election turnout rates. It’s an astonishing turnout figure considering only about 4.6 million Texans cast ballots in the 2014 midterm election — a difference of almost 3.7 million. Republican Sen. Ted Cruz finished with 50.9 percent of the vote, Rep. Beto O’Rourke earned 48.3 percent of the vote, and the rest went to Neal Dikeman, a Libertarian. O’Rourke, came within 3 percentage points of defeating Sen. Ted Cruz, which is close enough to put Texas at the center of two of the big post-election questions: Is Texas a 2020 swing state? And; Will O’Rourke run for president in 2020, or challenge Sen. John Cornyn for his Senate seat in 2020? ‘He’s Barack Obama, but white’: Beto O’Rourke blows up the 2020 Democratic primary — Top party donors and operatives are eager to see the Texas congressman jump into the presidential race. 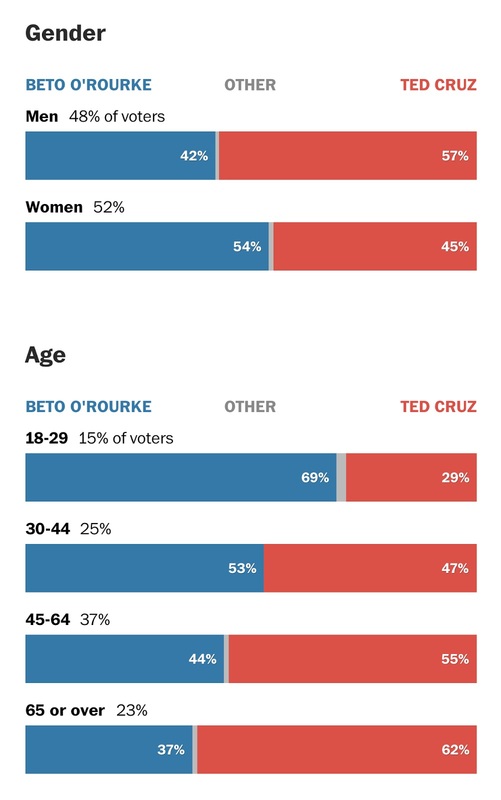 While Beto O’Rourke lost his bid to unseat Sen. Ted Cruz, by three percentage points, his campaign energy activated voters who were either apathetic, or thought they did not make a difference, or thought no one cared about them — the state’s Latinos, Millennials, GenZs, and other typical non-voters. 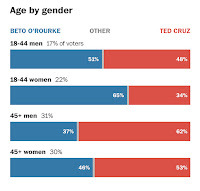 O’Rourke won the female vote and voters age 44 and under. 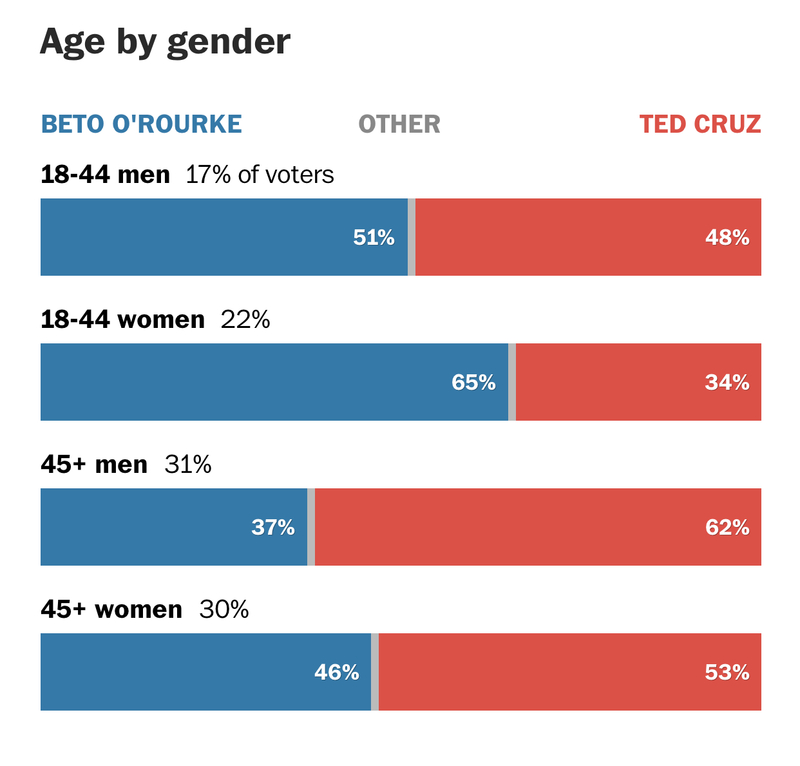 O’Rourke was also more popular with women age 45 and older than with men in the same age cohort. 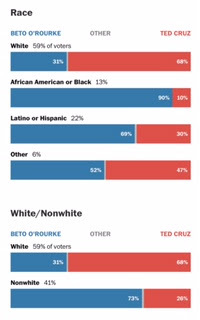 O’Rourke was not popular with Anglo voters, but non-Ango voters were a substantial part of his voter base. By earning 48.3 percent of the vote, O’Rourke performed better than any Democrat had in a statewide race in Texas in a long time. 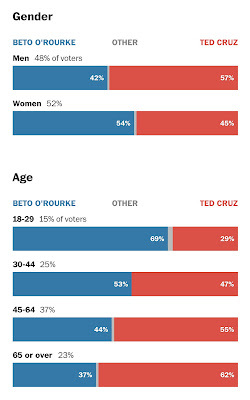 Even as O’Rourke fell short overall, according to the CNN exit poll, he won 58 percent of voters under 45, and 71 percent of voters under 30. Cruz won 58 percent of the votes of those 45 and older. 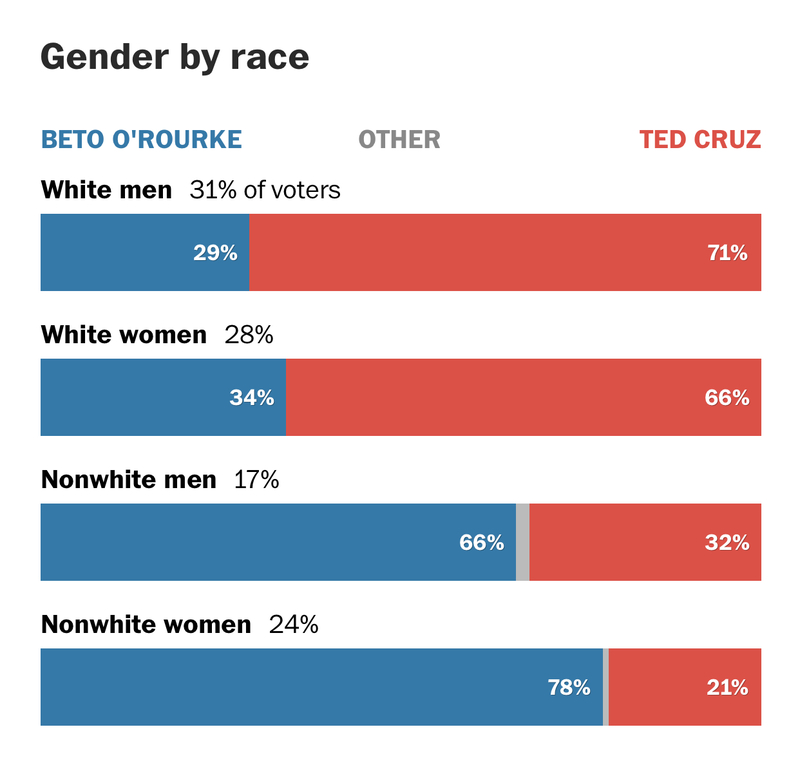 O’Rourke, according to the exit poll, won 34 percent of white voters. Four years ago, Wendy Davis captured only a quarter of the white vote. Even though he won just 32 of the state’s 254 counties, O’Rourke’s margins within the state’s booming metro areas is evidence those parts of the state are trending more Democratic. O’Rourke’s county wins includes six counties Hillary Clinton lost in 2016, among them Williamson and Hays counties in Central Texas and Tarrant County, known as the most reliably conservative large urban county in America. Perhaps, no longer. O’Rourke did not activate left-leaning Texas voters single handed, says Josh Blank, manager of polling and research for the Texas Politics Project at the University of Texas. Texas Democrats flipped 2 U.S. House Districts with the election of Lizzie Fletcher and Colin Allred. Texas Democrats made history by sending the first two Latinas to Congress with the election of Sylvia Garcia and Veronica Escobar. Texas Democrats flipped two seats in the Texas State Senate. Texas Democrats, led by a slate of female candidates, flipped 12 seats in the Texas State House of Representatives marking the biggest shift in the lower chamber since the 2010 midterm elections. Texas Democrats swept Bexar, Fort Bend, and Harris while holding Democratic strongholds along the Rio Grande Valley, and in El Paso, Dallas, and Travis counties. Texas Democrats made huge gains in suburban Tarrant, Hays, and Williamson Counties. Texas Democrats flipped the DA races in Fort Bend, Bexar, and Dallas Counties. Texas Democrats swept the 1st, 3rd, 4th, 5th, 13th, and 14th Court of Appeals, ushering a new era of fairness and justice in Texas. Cruz beat O’Rourke by a margin of about 220,000 votes. The 2018 county by county turnout map took a familiar form, with Democrats winning in the metro and South Texas counties, and Republicans winning everywhere else. But that's the closest U.S. Senate race in Texas in 40 years. Republicans had won the last four Senate races in Texas by 1 million votes or more. Cruz hung on by running up big numbers in the Texas Panhandle, West Texas, and East Texas and by squeezing out wins in metro suburbs. O’Rourke won 32 of the state’s 254 counties, including the state’s large urban areas. Texas’ urban areas account for about 45 percent of the state’s vote. O’Rourke beat Cruz by nearly 900,000 votes in the state’s urban areas, with 61.8 percent of the vote to Cruz’s 38 percent. Not only did O’Rourke dominate Cruz in and around the state’s five largest urban areas of Houston, Dallas, Fort Worth, Austin and San Antonio, he also won a higher percentage of the vote than Hillary Clinton in the 2016 election. O'Rourke revealed untapped opportunities for Democrats. Four years ago, U.S. Sen. John Cornyn won the I-35 corridor by nearly 350,000 votes over his Democratic opponent, David Alameel. But O'Rourke carried those same counties by more than 440,000 votes. That is a nearly 800,000-vote swing in just four years. O’Rourke exposed a blue spine up the middle of Texas along the I-35 corridor from Laredo to the Oklahoma border. O'Rourke flipped counties along the corridor that had not voted for a Democrat for statewide office since Ann Richards first ran for governor in 1990. Even in the counties O'Rourke lost, his defeats were often much narrower than those of past Democratic candidates. Five Republican candidates for Congress in Texas, almost all of them big favorites, won with less than 51 percent of the vote. All five of their districts are along the I-35 corridor, making them all but certain to be targeted by Democrats in 2020. In the Texas House, Democrats flipped 12 seats previously held by Republicans. Ten of those districts are along I-35. In the Texas Senate, Democrats flipped two seats, both along I-35. And they nearly took a third seat north of Dallas, where Republican Angela Paxton won just 51 percent of the vote. The success of the Democratic ticket along I-35 was supported Texas' dramatic population growth in the urban and suburban communities along I-35. In short, the Democratic Party’s base of voters is expanding significantly, while the GOP's base is receding to far rural counties. Cruz got back more than half of his core urban county losses from metro area suburb counties, like Collin and Denton counties, with Cruz getting 59 percent of the vote on average to O’Rourke’s 41 percent in metro suburban counties. But O’Rourke capped Cruz’s wins in most of metro suburban counties. For example, O'Rourke lost Collin and Denton counties, but by dramatically smaller margins than past statewide Democratic candidates. In Denton County, O'Rourke did 50,000 votes better than Cruz's last opponent. In Collin, he fared almost 70,000 votes better. But it was "non-metro" area rural county Texans who really saved Cruz and the rest of the statewide Republicans — from Gov. Greg Abbott to Attorney General Ken Paxton to Agriculture Commissioner Sid Miller — from the rising blue tide. The 172 "non-metro" rural counties account for about 12 percent of the state’s vote. 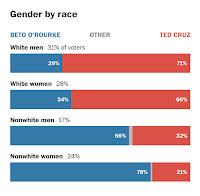 Ted Cruz and the rest of the Republican ticket won largely because they pulled 73% of the vote out of the "non-metro" counties, to Beto O'Rourke’s, and the other Democrats’, 26.6 percent. Texas Democrats’ biggest win on election night was flipping four major state appeals court districts that serve Austin, Houston and Dallas, pushing aside 19 incumbent Republican appellate judges. Democrats now hold majorities on seven of the state’s 14 appeals courts. Before Tuesday, they held seats on just three. State appeals courts sit between Texas’ scores of trial courts and its two high courts. They are intermediate courts — meaning their rulings can be review by the state’s two high courts, the Texas Supreme Court and the Texas Court of Criminal Appeals, which remain fully in Republican hands. The appellate courts hear thousands of cases — the Dallas-based 5th Court of Appeals, for example, handled some 1,800 cases during the last fiscal year — while the Supreme Court takes up about 100 cases. The new justices will generate far more decisions than the state’s two high courts can overturn, even if they want to. And the state’s urban-based courts are — unofficially — considered more influential in setting precedent than the smaller, rural courts. All appellate judges are bound by the tight restrictions of the law, but the cases that come before them often fall into gray areas between corporate business interests the interests of everyday Texans. Democratic justices are generally considered to be less inclined than Republican justices to overturn jury verdicts, like in cases where victims are awarded top dollar after being harmed by large corporations. Additionally, in Harris County alone, which is home to Houston and the third-largest county in the United States, Democrats unseated 59 Republican judges — including 23 district judges, 13 family court judges, eight county civil judges and probate judges, and 15 misdemeanor judges. Of the newly appointed Democrats, an unprecedented 17 are black women, significantly changing the face of a judiciary that had been primarily white. Collin County Democrats’ biggest win on election night was the part they played in flipping Texas' 5th District Court of Appeals. For 19 uninterrupted years, all 13 elected judges on Texas' 5th District Court of Appeals were Republicans, earning a reputation for being one of the most conservative courts in the state. But that changed dramatically, when voters elected all eight Democrats on the ballot to replace Republicans previously sitting on that appellate court’s bench for six-year terms. Three more are up for re-election in 2020 and the final two will be up for re-election in 2022. The remaking of this appellate court was the part of Texas' rising blue tide that attracted the least attention, but which yields possibly the greatest benefit to everyday Texans. The court hears civil, criminal and family appeals cases in Dallas, Collin, Rockwall, Kaufman, Grayson and Hunt counties. All 13 seats on the bench are at-large, meaning voters from Dallas, Collin, Rockwall, Kaufman, Grayson and Hunt counties vote for all of the seats. Even though Dallas County voters have given Democrats running for this appellate court big vote margin wins for years, the margin was never enough to counter balance their vote losses in the five other conservative-leaning counties, in particular Collin County, the largest by far of the district’s conservative counties. 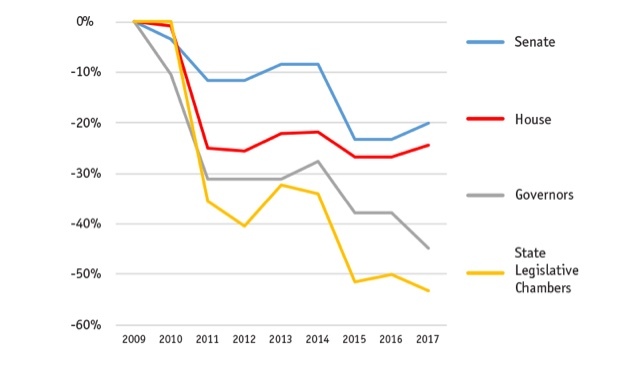 This year, the eight Democratic appellate court candidates lost Collin County by about 15 points, cutting their vote losses to half of Democratic candidate losses in past election years. 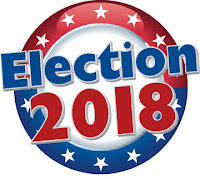 Of Texas’ 15 largest counties, Collin County ranks second behind Travis County in the rate of turnout, with 61.4% (357,034) of the County’s 581,684 registered voters casting ballots. The rate of voter turnout in Travis County was 62 percent. 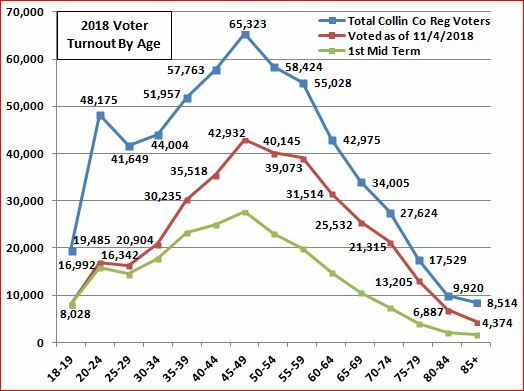 Collin County turnout for this midterm was nearly double that of past midterm election cycles, and approaches turnout levels typical for presidential election years. In 2018, Democrats improved their performance by up to 20 points over candidates who ran in 2014 and by 8 to 10 points over candidates who ran in 2016. In 2014, the Democratic candidate for U.S. Senate received 28 percent of the vote to Sen. John Cornyn's 68.4 percent. This year, Beto O’Rourke, the Democratic candidate for U.S. Senate earned 46.3 percent of the vote to Sen. Ted Cruz's 52.6 percent. In 2016, the top federal Democratic candidate on the ballot, Hillary Clinton received 38 percent of the vote to Donald Trump's 55 percent. In 2014, the Democratic candidate for Governor, Wendy Davis, received 32.6 percent of the vote to Gov. Greg Abbott's 65.7 percent. This year, the Democratic candidate for Governor, Lupe Valdez, received 39 percent of the vote to Gov. Greg Abbott's 58.8 percent. But Valdez under performed every other countywide Democratic candidate on Collin County ballots. 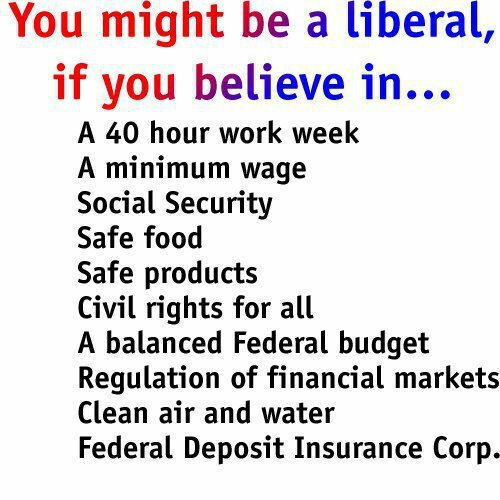 The Democratic candidate for Lt. Governor, Mike Collier, received 43.65 percent of the vote to Lt. Gov. Dan Patrick's 54.2 percent. The southwest quadrant of Collin County has been trending left faster than the other three-quarters of the county, as is apparent in the performance of Democratic candidates for state house districts 66 and 67. Sharon Hirsch, the Democrat for House District 66 in the far southwestern corner of the county was only 391 votes short, out of 70,192 ballots cast, of beating her Republican opponent Matt Shaheen. Sarah Depew, the Democrat for House District 67, which is the next district east of HD66, fell only 1,672 votes short, out of 75,119 ballots cast, of beating her opponent Jeff Leach. Lorie Burch, the Democrat for Congressional District 3, which includes all of House Districts 66 and 67, plus more right-leaning areas of the county also turned in a good performance by earning 44 percent of the vote to her Republican opponent Van Taylor's 54 percent. The following slider table of final results shows the relative county and district wide results for several key elected offices in the southwestern quadrant of Collin County. A precinct by precinct slider table is at the bottom of the article. 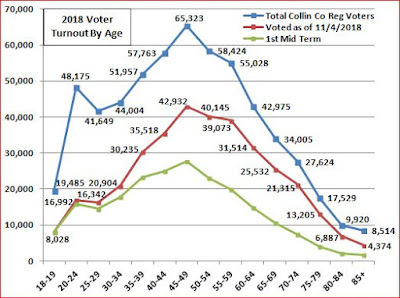 The demographic patterns of Collin County turnout for the 2018 midterm closely matched turnout patterns for the 2016 presidential election, except those patterns have continued to shift left over the past two years. 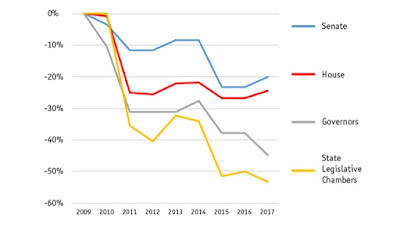 It is important to understand and accurately interpret two key data points here: The percentage of registered young people who turnout to vote ballots; and the share of all votes that were cast by young voters in relationship to older voter's. Again, the percentage of registered young people who voted in 2018 closely matches this turnout pattern in the 2016 presidential election. By earning 48.3 percent of the statewide vote, O’Rourke performed better than any Democrat had in a statewide race in Texas since at least 1994. Even though O’Rourke won just 32 of the state’s 254 counties, O’Rourke’s margins within the state’s booming urban areas, and many suburban areas as well, provide evidence those parts of the state are left-trending. These are the main lessons Texas Democrats must take away for the the 2018 election cycle to build upon in the 2020 election cycle that started on November 7, 2018. As Texas Democrats continue to work to make Texas's suburban counties blue, especially Collin and Demton Counties, and rural counties swing counties in 2020, they will be helped by major population growth of more left-leaning voters in and around the state’s largest urban and suburban areas. The rising population of these metro areas will build on the the record 2018 midterm turnout momentum to feed Texas' rising blue tide into 2020 and beyond.